I recently spent 3 weeks working on a special diet with my dad, who is diabetic, and so have been exploring lots of new healthy breakfast recipes. The basis for so many great breakfasts is fresh nut milk, which is SO EASY to make – it literally takes only 5 minutes in the morning if you have soaked the nuts the night before. It’s actually a great way to start the morning – don’t even bother to rinse the Vitamix afterwards – just use it to make a breakfast smoothie! Blend soaked nuts with water in Vitamix on high until completely smooth – about 30 seconds. Pour through a nut bag into a large bowl, squeeze nut bag well to extract liquid. (Discard dry nut fiber, unless you can think of something creative to do with it. I tried…. Dehydrated, there is some potential to make homemade biodegradable packing peanuts, but other than that I could not find a use for it). Add salt and flavorings to taste. Store refrigerated in a glass quart container for up to one week. Note: you will need a good nut-milk bag for this. These can easily be ordered online, and probably also found at your neighborhood health food store or Whole Foods type market. In a pinch, I have also used a tea strainer, a fine mesh cloth vegetable bag, and even a (new) nylon stocking as my nut-milk strainer. 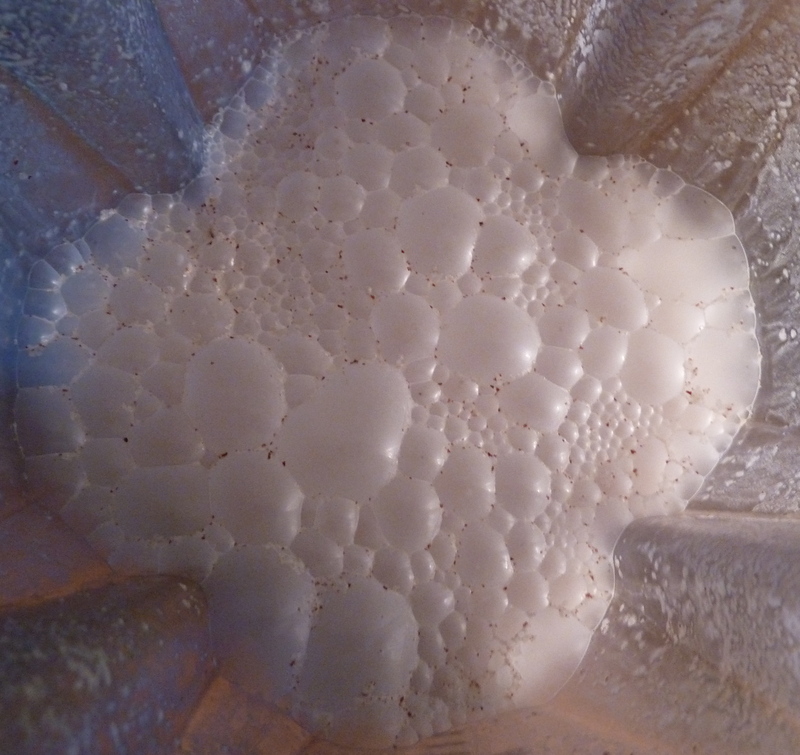 Trust me… all of this is exactly what gives nut milk a bad name – a $12 nutbag at Amazon is a very worthwhile investment. 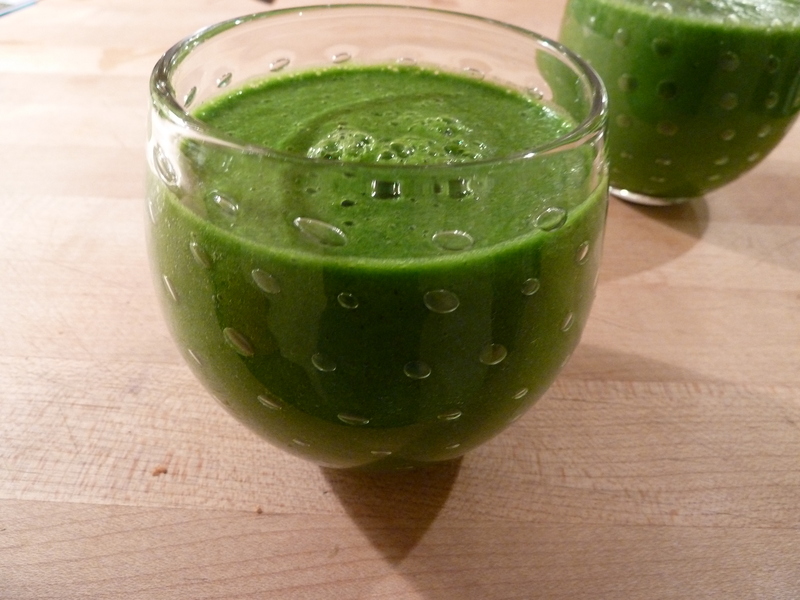 It was a revelation to me that you could throw a bunch of greens in the blender and have it turn into a refreshing drink that is completely delicious and satisfying. (Really! You have to experience it to believe it.) Sarma Melngailis has dedicated a whole section to her love of greens in Living Raw Food with some fantastic green blender drink recipes which is really inspiring. The best thing is you can do all of this in a Vitamix which is much easier to clean than a juicer. You can play with this with whatever greens you have on hand, and the base I usually start with is the grapefruit, lime and agave to sweeten. 1 whole bunch fresh cilantro, washed well, but stems and all! 1 bunch of any greens, washed well, any tough stems removed. The only trick to this is the order you put things into the blender – make sure you put the juicy stuff in first (graperfruit, cucumbers) so you get a liquid going before you start adding the greens. 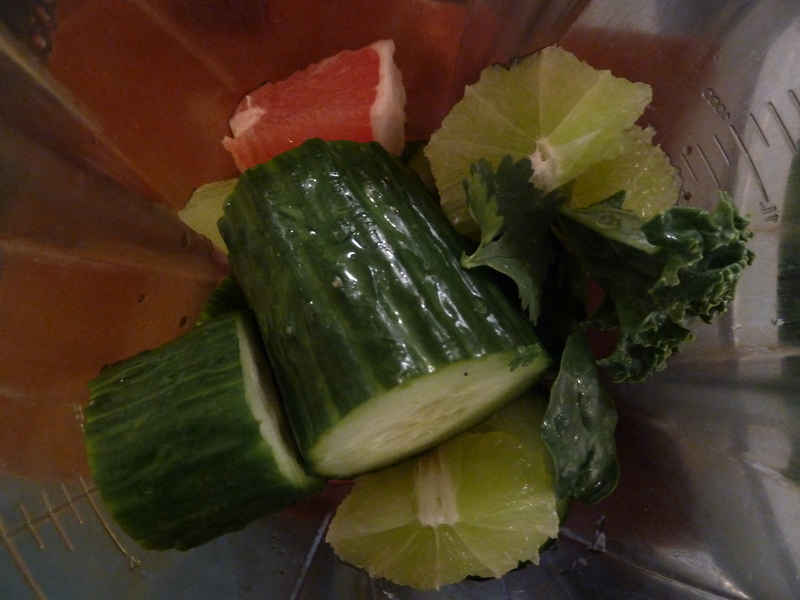 Then, bunch by bunch, just stuff all those greens in and blend up until its all completely smooth. Add a little water if you need to. Add ice cubes as you go to keep it nice and cool, and finish with the agave and lime. These are the key ingredients that make this all taste so good – don’t be afraid to make this fairly sweet. You will be surprised at how refreshing and addictive this is. The cucumber is really refreshing but not necessary – in NY in the winter I usually don’t have these laying around so I just add more water/ice. Try fresh coconut water instead!